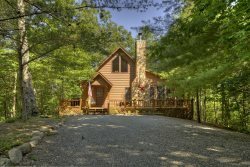 Literally 1 mile from beautiful, quaint Blue Ridge, Georgia in one direction and Mercier Apple Orchards in the other, this cabin is in a fabulous location. If you want the convenience of town but the feel of being out of town, Oakawana Lodge is your cabin! Comfortable and well appointed with gorgeous views, lots of outdoor living spaces and plenty to do inside. Don't miss out on this opportunity to have it all! Please note: This cabin is on a graveled road with an incline. While 4 wheel drive is NOT needed, you must travel the road with caution. When incline begins, please shift to lower gear, maintain a consistent speed, do not stop and try to start again without backing up because you will spin gravel and get stuck or dig holes in the road. It is very important that you follow these simple steps. Also, no more than 2 cars are allowed at this cabin. There's not enough parking space and parking on the neighbors property is not permitted. TV`s: Living Room 45",Main Floor Bedroom 35", Master Bedroom 35" and Den 65"
Other Bed: Queen Murphy Cabinet Bed in the Den and a Twin Day Bed in the Open Loft with a Twin Trundle.